Alex Chu & the World's Biggest Dim Sum Cart! 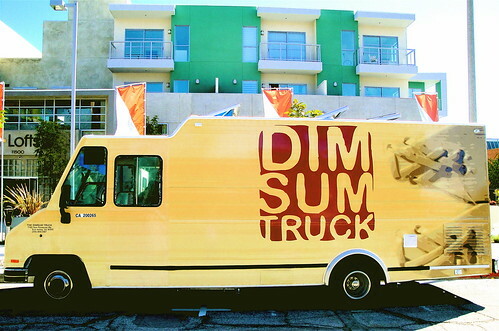 Introducing Dim Sum Truck. Los Angeles Wide. To the rescue! Kinda like the AAA Tow Truck but tastier! There was a time when I was very young and full of questions and one day, while eating dim sum with my family at our favorite dim sum palace, I decided to ask some of those questions. "Mama," I inquired with some reticence while carefully timing my queries between her eager bites of siu mai, "Why isn't Santa Claus real?" She responded, while reaching for the tea kettle, disgusted to discover that not a drop of chrysanthemum was left inside and then flipped up the kettle's top and waved over one of the vested employees, "Santa Claus isn't real because he's not." This type of circular reasoning was very effective on me at that age, so I moved on. Why isn't there an Easter Bunny? Because that's not real too. Because that's the color of the sky. Then, the restaurant manager stopped by our table to let us know that the dim sum service would end by 2pm. I looked over to my mom and wondered aloud, "Why don't they serve dim sum at night?" The shrimp in the har gow Mama was chewing suddenly lodged in her throat, but somehow she managed to squeeze out the following, "Are you stupid?! Who serves dim sum at night? Nobody! Dim sum is only for the day time. That's just how it is. That's how it always will be. You're a crazy child! I can't believe you're my son!" Well, Mama, if you're reading this, that's all about to change! 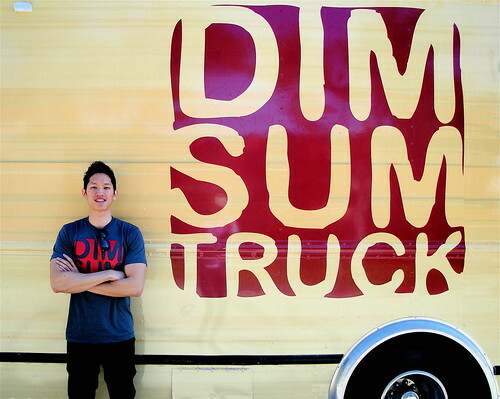 Dim sum, as you, I and the world know it, is going to be turned on its head, and an entrepreneurial guy named Alex Chu and his Dim Sum Truck are going to do the turning. Yes, I know it's another food truck but this one hits me at a gut level! It had me at "har gow". I love dim sum like Tiger Woods loves, uh, er, ahem, Gatorade, yeah, Gatorade. 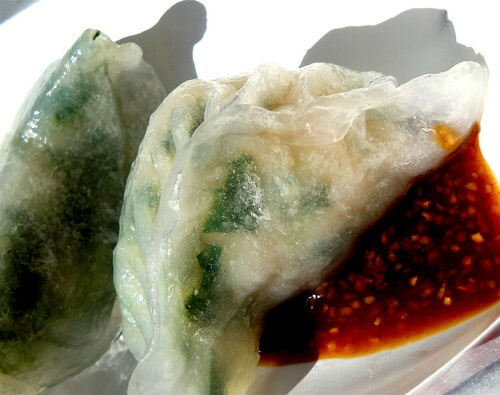 The Dim Sum Truck welcomes the uninitiated and the novice and embraces them all warmly like wonton wrappers around a lump of ground pork and chopped shrimp. But the life-long Lazy Susan jockey won't be left out either. What really sends me over the moon is that dim sum will no longer be exposed exclusively to, as Sir Andrew Lloyd Webber would put it, "the garish light of day." The shackles have come off the sui mai. It can now be enjoyed at night along with all of the other nocturnal delights. This is no simple feat. 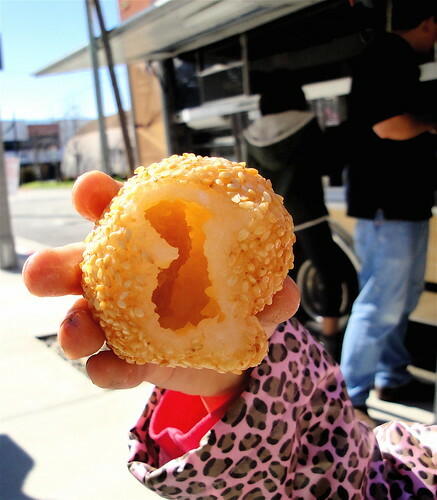 Unlike many of the other food trucks taking up LA curb estate, the Dim Sum Truck's offerings of dumplings, buns, fun and feet need to be completely or mostly cooked before the gigantic dim sum cart lands. Dim sum is complex stuff, involving a few cooking methods and a dizzying array of ingredients. (When was the last time you made dim sum at home from scratch? And not just a fistful of har gow, but the whole enchilada?) It is certainly not a matter of slapping a bunch of seasoned protein in between an envelope of carbs, whatever those may be. And the fact that there hasn't been a dim sum truck until now is no surprise. Alex Chu is a soft-spoken, young guy who comes from a restaurant background. In fact, he's even hawked dim sum as a cart pusher up in a San Jose Asian fusion restaurant. A recent graduate of USC in International Relations and Entrepreneurship, Alex recruited the help of family friends to seek out dim sum chefs, and he resourcefully harnessed the talents of his friends to put together elements of the business from the Chinese "stone seal" style logo to his marketing materials. Alex invited me for a complimentary tasting of his truck's dim sum selections. Dim sum translated means "to light the heart". He wasted no time and busted out the classics. 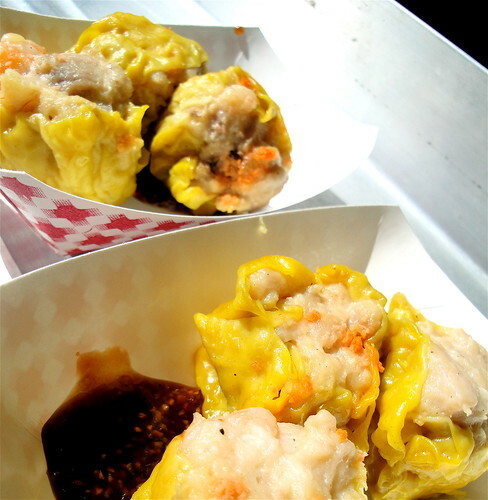 Siu mai, the pork and shrimp dumpling, perhaps the most popular of all the "heart lighters", the Dim Sum Truck's rendition is bloated (and I don't mean that in a TMI way). This siu mai is plump with seasoned ground pork, chopped shrimp, water chestnuts and topped with a smidgen of crab roe. The moist, chewy and slighty crunchy textures are just as rewarding as its savory and fragrant filling. Even the deep yellow wonton wrap stood out as something more substantive than that of the standard siu mai. This siu mai is meaty through and through and, I'll even go as far as saying, the most satisfying siu mai I've eaten in the States or abroad. Accompanying and enhancing many of the different dumplings is the Dim Sum Truck's secret sauce made up of granulated garlic, oyster sauce, chili garlic sauce and only Alex knows what else. Huge har gow. Who you calling "shrimp"?! The first thing I noticed when Alex handed me a serving of the har gow (the shrimp dumpling) was the size. Big. Larger than your average har gow. The shrimp's sweet and savory flavors juxtaposed with the bamboo shoot's slight pungency were enough to, well, light my heart via my stomach. Har gow is easily flubbed due to its temperamental tapioca-wheat wrapper, these were masterfully executed and generously portioned. Peek-A-Buns! 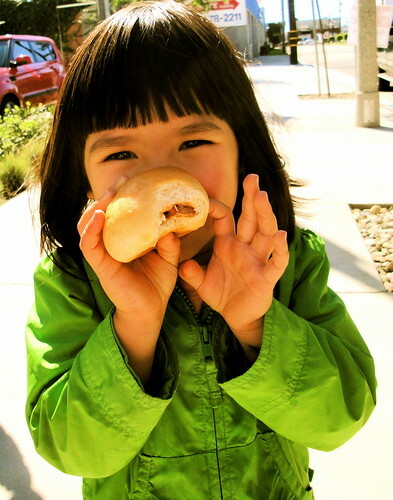 Baby loves the baked BBQ pork buns. However, when the baked BBQ pork buns came out, I noticed the lack of a glaze on the bun's top making it seem more like a roll. The filling was proper: Chinese BBQ pork, mostly sweet and a bit salty. But, that satisfyingly sticky, sweetness of the glaze detracted from the bun's authenticity. The good news is that it's an easy fix. 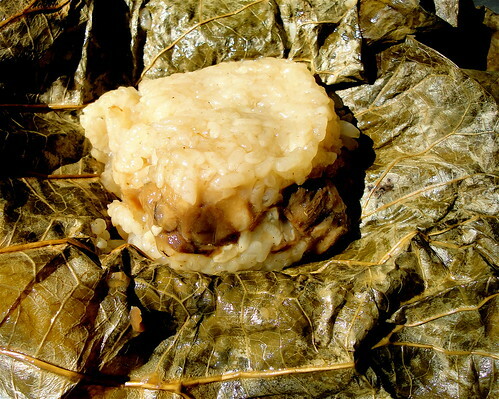 I love zongzi, the famous sticky rice filled with either savory or sweet ingredients and wrapped with bamboo or lotus leaves. It's also known as a Chinese tamale. 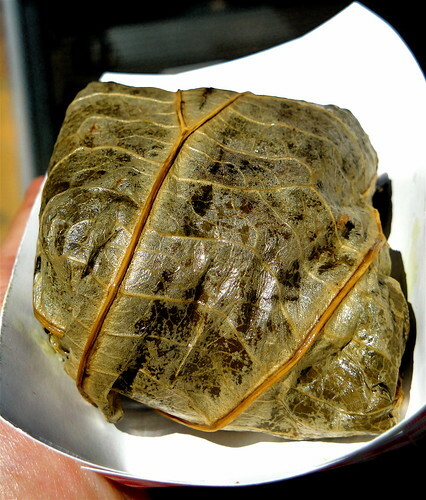 The Dim Sum Truck uses lotus leaves giving it a fantastically fresh fragrance. A calculated combination of salted pork chunks, sweet Chinese sausage (xiang tsong), dried shrimp and slivers of Chinese mushroom maximize the heady bouquet of flavors. This is a quality zongzi, probably good enough to toss into the Miluo River. Although I'm not a big fan of the steamed chicken bun, the Dim Sum Truck conjures up a good one with tender pieces of chicken and a powerful infusion of ginger giving the bun a nice bright burst of flavor. 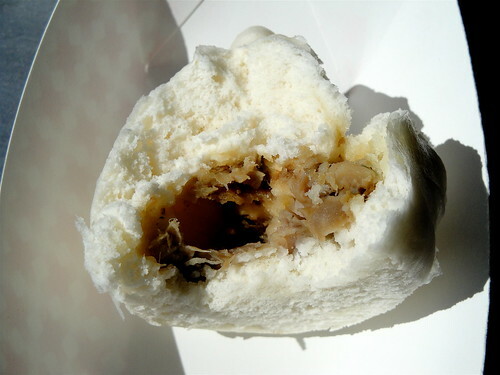 Unlike the har gow and siu mai, however, the filling in this bun is on the anemic side and could stand a good beefing up. Again, it's a simple fix. Have your turnip cake and eat it too. 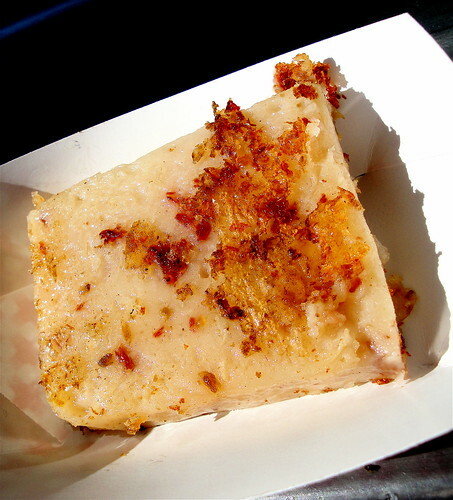 Keeping with the generous portioning, the fried turnip cake is hefty. With the outside grilled to a crisp sheath and the inside dotted with dried shrimp, it is tasty, dense, satisfying and will fill you up quickly. Save this one for near the end of your meal. See right through the deliciousness. 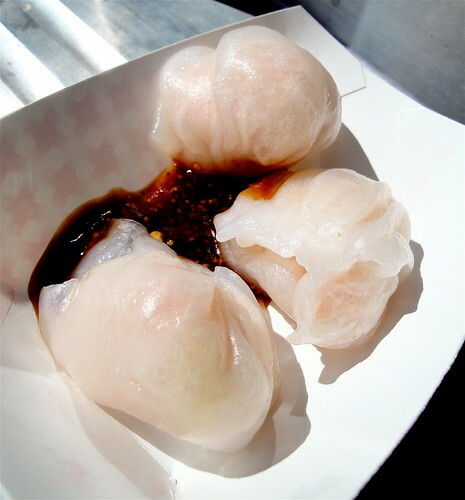 There are specialty items that the Dim Sum Truck will scrawl on its menu board on a daily basis. This day's featured item was the shrimp and chive dumpling. Sealed in a crystalline wrapper, the chunks of shrimp and bits of chive peer through the translucence as if they were frozen in ice. The ingredients are so fresh that they almost overpower each other, but that's a battle where you'll end up as the winner. It looks like a duck and tastes like a duck, but it's not really a Peking duck. What would an LA food truck be without its own signature fusion taco? Yep, the Dim Sum Truck has its own and it is pretty awesome. 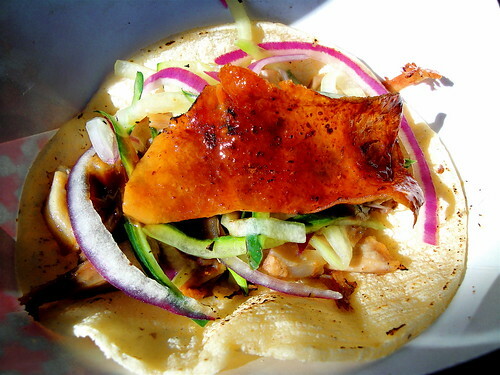 It's the Peking duck taco. Loaded with good and fresh ingredients, it's mostly consistent with the classic presentation of Peking duck except without the steamed Mandarin "pancakes". In this version, a corn tortilla is used instead of the bready pancake. The glaring problem is that the Peking duck taco contains no actual Peking duck. Duck, yes, but not Peking duck. A more accurate description of this duck would be a Chinese roasted duck. Peking duck's preparation is a complex, time consuming and expensive one. This is largely how the orgasmically crispy and succulent duck skin is achieved. The Dim Sum Truck takes a kitchen torch to the skin right before serving, hoping to replicate the crispy skin of a Peking duck. Unfortunately, this method only accomplishes in burning off the fat, oil and, alas, flavor, leaving limp duck skin. A Chinese roasted duck taco can be just fine, just add some orange duck sauce with a little chili and your fusion taco is complete. People who know me know that I'm not a dessert guy. However, the few sweets I do enjoy come in the form of dim sum. The egg custard tart and the sesame ball being two of my favorites. 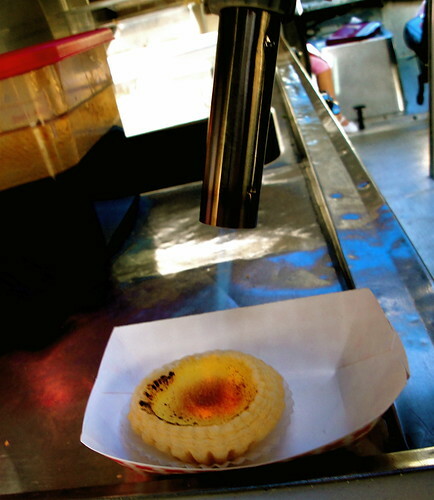 The Dim Sum Truck's egg custard tart has an ostentatious crème brulée appearance on its surface for which Alex Chu's trusty kitchen torch is responsible. However, there is no hard coating on the tart like on a crème brulée, only caramelization. This isn't a traditional way to present the tart, but it does intensify the sweetness. The crust is a little crumbly and not as firm and toasty as I prefer. It was possibly under baked. However, my wife had no complaint about the crust. Aesthetically the lotus sesame ball was spot-on. Internally, the lotus paste is not my favorite kind of guts for the sesame ball to have, I prefer the red bean paste because it's sweeter. My issue may even be visual. I find the contrast of the dark red bean paste against the oily tan shell to be, well, sexier. The filling was woefully lacking here as well. But I didn't mind so much since at that point I was as stuffed as one of the truck's siu mais. No need to push this cart, baby, cuz we got horses under the hood! With the normal kinks of a new business that naturally need to be worked out, the Dim Sum Truck is well on its way to lighting the hearts of dim sum lovers all over Southern California with its fresh, high quality and generously portioned food. One standout omission on the Dim Sum Truck that saddened me a little was the chicken feet or phoenix talons. It's my absolute favorite item at dim sum service. It's also my most reliable measure of a good dim sum restaurant. Alex assures me that chicken feet are coming soon. He also promises that the Dim Sum Truck's night service will be starting in the near future, "Staying open as late as people want us to." Hear that, Ma? Chicken feet dim sum late at night. Who says there's no such thing as Santa Claus. 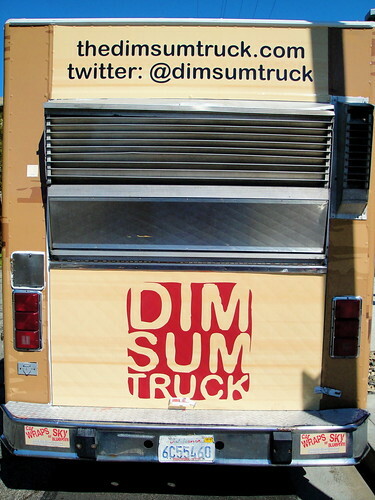 Follow the Dim Sum Truck on Twitter: @dimsumtruck. what a sham! where's the surly chinese cart lady with a jade bracelet that'll give you "that look" even if you have the slightest accent in ordering in Chinese?! But yeah, my non-SGV friends are totally waiting for a truck like this to happy. My mom wasn't as nice when I asked about dim sum for dinner... I think she said something along the lines of "Aiya, I'd rather give birth to a char siu . . ."
Is that your daughter? Why don't you talk about her more! Nice rundown, I'm craving dim sum now. What's the mileage on that truck - can you point it east and put a brick on the accelerator? Living on the west side, treks into the SGV aren't really appealing due to traffic. I'm so happy there's a dim sum truck now! Dang, could practically taste the food you got so close. Looks amazing. Thanks for the heads up! PS. The Tiger Woods crack was a riot. Eddie, Why is your funny bone funnier than everyone else's?! This post was magnificent (as was the one titled, ?Why are all dim sum cart pushers Asian"). A shame I missed you on Sunday. I suppose Alex Chu could dress in drag and wear the infamous jade bracelet. He might have to practice that look, though, since his Chinese isn't the best either. Yeah, that's one of my girls. I bring them up when they naturally come up. Thanks for the nice comment! Yeah, you should try this truck! I've been dreaming about the siu mai. Looking for a brick right now. I'll send her over pronto! I feel your pain. I'm in the Valley. Although, we have one satisfactory place, A&W. Can't touch the SGV though. Haha! I'm glad you like the Tiger joke. Are you allergic to a lot of dim sum? My daughter is. Oh, you're too sweet! Thanks for the nice comment. Hope you're well. Yeah, it is good. Thanks for stopping by! Yes, it can be easy to dismiss a new food truck. I think LA is becoming desensitized to the mobile food movement. However, quality trucks will still do well. I'm sure when Ludo Bites launches as a truck, the craze catch a second wind. Alex is dedicated to quality dim sum. However, you right. He needs to keep close watch on the quality and consistency. It's key as you so eloquently pointed out with Suzanne Goin's Tavern. Why can't we have cool things like that here? We have a large enough Chinese population. I want some turnip cakes now. And chicken feet. My two faves. Yum! I love dimsum so much especially siomai. I wonder what to expect in restaurants Melbourne. Hey Eddie, why thank you for asking, yes I AM allergic to most dim sum! I'm allergic to both soy and rice (among many other things), and I'm Chinese, isn't that crazy? So for dimsum, I usually pick apart the dumplings and eat the insides only. It's messy, and not pretty to watch, but it gets the job done. (I also just recently returned from China, that was particularly ugly). Which foods are your daughter allergic to? I blog at www.foodallergyqueen.com and post recipes and reviews for managing multiple food allergies. you must let me know what Melbourne dim sum is like! I'm hungry too. I'm always hungry! My 3 year-old is allergic to soy, eggs, dairy, peanuts and something else major. Can't remember right now. Really not easy to feed her outside of our house esp. in restaurants. I'll check out your blog! Thanks! Dim Sum at night and Dim Sum in a cart is not new. We have heaps of these in Asia, especially Malaysia. Plus.. it's the norm for us living in Asia to go for a Dim Sum snack (or feast!) after a crazy night of clubbing as Dim Sum establishments open till 3am..